As the smoke clears form the Dream Weekend in Negril, the focus move to this Saturday's staging of Champions in Action at Jamworld in Portmore. With a line-up that many are lauding as better than Sumfest, the inclusion of Sizzla, Capleton, Anthony B and others is a calculated move on behalf of the promoters. "Our show is not just about who's hot and who's hype" said the Presidential Click spokesperson. 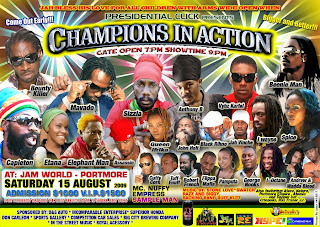 "Champions in Action is a showcase of the best in Dancehall and Reggae talent over the years so we've included artists that have proved they can deliver a catalogue of hits for the patrons. "A lot of anticipation is also surrounding Bounty Killer's appearance, after his show-stealing performance at Sumfest. His musical son, Dancehall's superstar international flag-bearer Mavado, is sure to repeat his fiery set at last year's Champions in Action.